How interesting. Even after being shown the kiss, I still see the two faces as cheek-to-cheek. I saw them as cheek to cheek at first, also. Now, I can see them as kissing most distinctly but still can see the other 2. Now Ive got THREE separate images and I might get motion sickness soon. Very good though. Sweet! When I first saw this, I saw a slightly distorted single face. that’s what I saw until I looked at the solution – a slightly distorted single face. Very Cool! Totally genius!! Wow, that’s really outstanding. Thumbs up! This was the best illusion I’ve seen on this website to far! Woo. But if they’re going to do all that smooching, maybe they should just get a room. They did! you’re peeking though the window! That’s friggin cool as hell! It took me a minute, but when I saw it, I was blown away. Woah, took me a while to get that one. That is awesome! wow. i thought it was the fact that if u stare at the face it moved around. Wow it is cool. I also saw it as a blurry image at first. the two people version is much clearer once you can see it. Thanks for your efforts here! I saw the single face, then the couple! Nice, and quite scary! Definately one of the top ten illusions I’ve seen on this website. Awesome find!!! Ok, I had to click on “here” to find the solution. Am I the only one who sees a roaring lion’s head in the gold part of the mask? Aw! That is so cute and really cool! I would love to see the winner as well. I also see the woman in two differtent positions: 1) Facing forward like the man and 2) tilted towards the man. The woman is different in the solution. Total awesome. Took a while but once you get it it’s on. 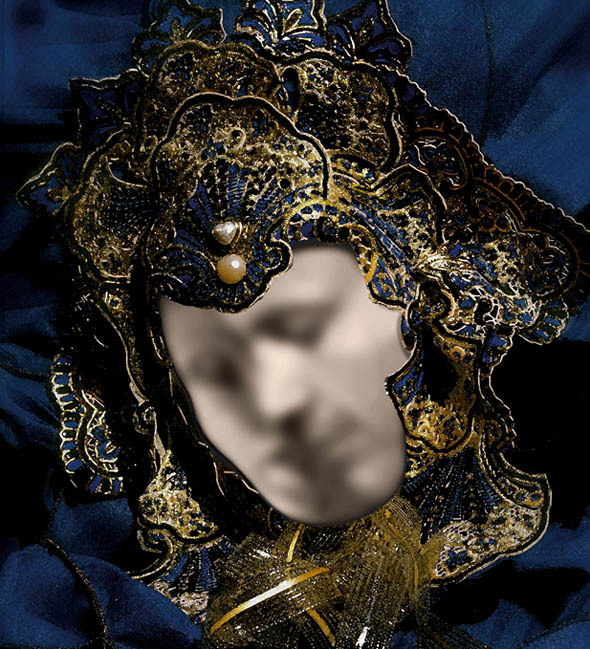 I’ve been looking for the 2 faces on the mask itself as you said. But you should have said to look in the hole in the mask. Very nice!! Also want to tell you I love this site and think you do a great job!! I agree with Cindy K, I see the 1 face front view, a couple getting ready to kiss, and 2 people cheek to cheek. I just keep seeing all 3 views. Awesome Illusion. One of the best I have ever seen!!!!!!! I was a bit confused at first – I was looking at the helmet which also has hidden face, trying to find the kissing faces there. I can see the two faces, but they do not look like they are kissing to me. It just looks like two separate faces side by side. If you click on “here” to see the example they look like they are kissing, but I only see shadow where the lips meet in the original photo. I like it though, very much. It looks like the faces are moving slightly, kissing. I don’t know if this is an animation or if the blur and my mind make them move. AWESOME!!! Checkd this with new site on my Verizon Droid2. The picture is almost to big for the screen, but the important part, the center of the screen, and the illusion show up fine. I also tried to tilt my screen to portrait, but the site did not change. I don’t know if this would have changed anything if the screen had rotated. As a side note this is one of my favorite illusions. I dont get it ! Yea it was awesome but i just dont get it … I bet ure thinking im crazy but rly whats tha big idea i dont think its a real illusion … What its gad other that a blury pic of 2 lovers ? So what! it is an illusion, don’t you see the man’s whole face first, then see a couple kissing??? Damn kewl….can I get it on Ebay?